Connect to National and Local Authors! Learn to Write, Publish, Market and Promote Your Book or Services! Network, Share and Strengthen The Metro Detroit Literary Community! You're Invited! Bring A Friend! Bring A Family Member! BRING EVERYONE!!! Adra Young's Premier Book Signing at Youth Ville in Detroit! For further information call 313-729-2573! I look forward to seeing each and everyone of you. Don't forget to send this out to others and help us spread the word of something good and positive in Detroit. PLEASE MAKE A NOTE OF CHANGE IN VENUE AND SCHEDULE! READ BELOW! Poetry, Hip Hop, Deep House and so much more! Free Books, Silent Auctions, Book Swap & Donation Tables, Promotions Tables, & More! 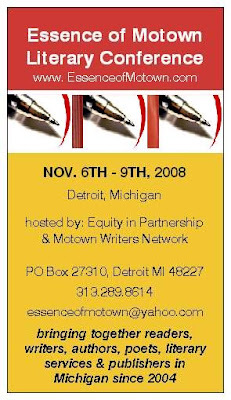 During the 2008 5th Annual Essence of Motown Literary Jam, many authors, organizations and publishers are having their events coincide with the conference. Help us Give! Be apart apart of the solution to better our literary community! < p style="TEXT-ALIGN: center" align="center"> Our new book will be officially launched at the 5th Annual Essence of Motown Literary Jam Weekend (Nov. 6-9, 2008) in Detroit, Michigan (http://essenceof motown.com/) As a special thank-you to everyone who comes out for this event, we'll include a FREE best-of-Authors Access CD-ROM jam-packed with MP3 files from all our shows for each person who buys a book at this event. Please RSVP for the conference ASAP or there will be no guarantee for vendor tables or lunch for workshops.